The Marabou Tarpon Toad has developed an excellent reputation as a very effective pattern for migratory tarpon. Gary Merriman, modified and adapted Harry Spear’s Tasty Toad pattern who modified and adapted Del Brown’s Merkin. So it goes with fly tying and the clear evolution of patterns over time. Suspending flies like the Toad swim as opposed to dip and jig like many flies do. Captain Tim Hoover knew Merriman and his fly well and further developed the fly to replace the rabbit strip with marabou to help eliminate fouling and to help it sink a little better. Hoover and Andy Mill went on to fish the Marabou Toad pattern extensively with well documented success in the highest levels of the competitive sport. 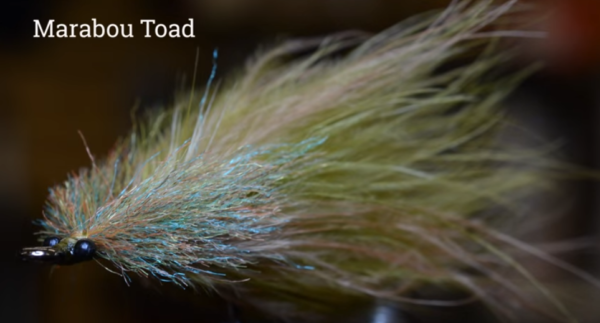 The following video by North 40 Fly Shop shows one simple way to tie the Toad. This includes the use of Hoover’s marabou tail adaptation. Pat Ford modified one of the versions and it still fishes successfully in Everglades National Park today. I never leave for the salt without one or more.